Sweet Floweret: How does the tooth fairy get in the house? How does the tooth fairy get in the house? I didn't really know what to title the post today. I've been super busy. In a good way. Not in an overwhelming I just want to get in my bed and hope it all goes away kind of busy ;) This post is a little random but full of fun. Read on. Today I am finishing up these cute hair flowers. My friend has 4 girls and wanted some fun hair accessories for Easter. I like the tulle on the back and the jewel makes it fancy shmancy. My oldest lost his first tooth this morning! We are excited for the tooth fairy to visit. 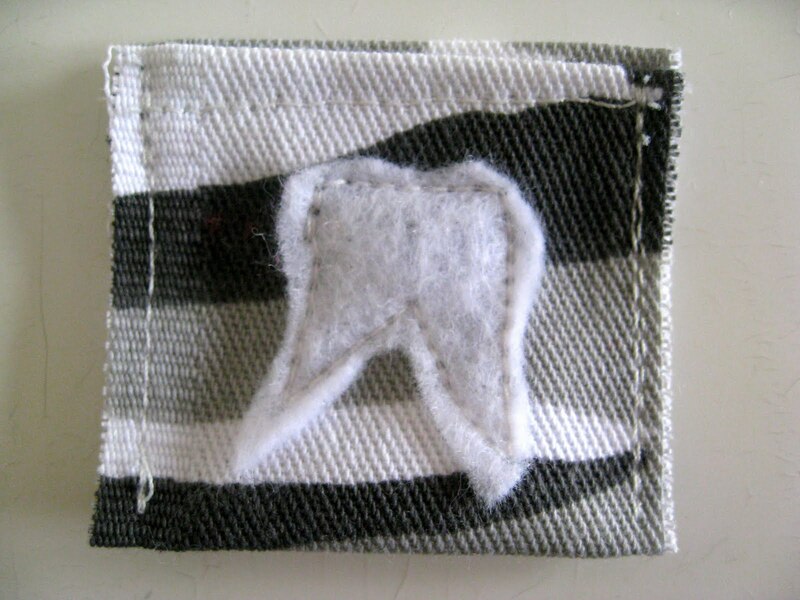 I made this cute (I mean COOL), boy tooth pocket ;) I cut the tooth free hand out of fleece and used a camo strip so that it'd be boyish for him. Hopefully the tooth fairy can fit a dollar in there! Because etsy is so saturated and because the type of rings that I sell are popular, I tried to think of something that would help me stand out. I thought that these little ring pockets would be cute as a free item that comes with the ring. What do you think? I love how cute it looks and it's great for gift giving. So, if you buy a ring of mine on etsy, you'll get one of these ;) Great for moms day! does anyone still just give quarters for teeth? my nephews and nieces are either really spoiled or you are really old fashioned?! Lina, the quarter was to show the size. 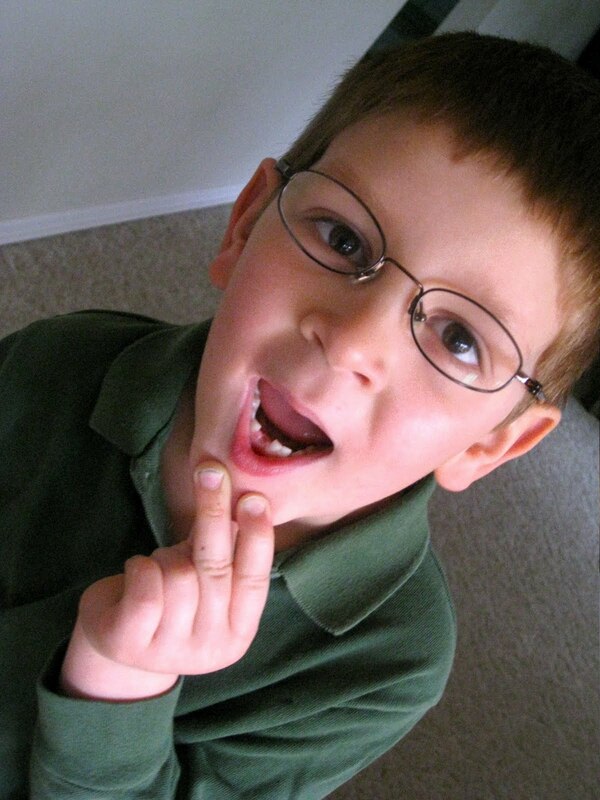 if you REALLY read the blog, you'd see that i wrote that I hoped the tooth fairy would be able to fit a $ in there. congratulations ethan! 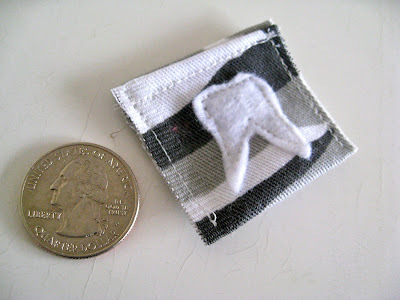 must be a baby out there who needed a tooth - at least that is what my girls tell me happens to those teeny tiny teeth. love the new 'all about me' section. you are one blessed lady and we are lucky to know you! hope to see you in the next week. happy easter and yippee for SPRING BREAK!!! !